A marker bar is a stripe, typically next to a scroll bar, that visually indicates where objects fall in a document. Each visual indication along the bar is called a marker, because it marks a place in the document. If the document is long, a marker tells the user where he or she needs to scroll in order to see a particular object. Popular applications such as Visual Studio, Eclipse, NetBeans, and MATLAB all use a marker bar to visually indicate where compiler errors and breakpoints fall in a file. 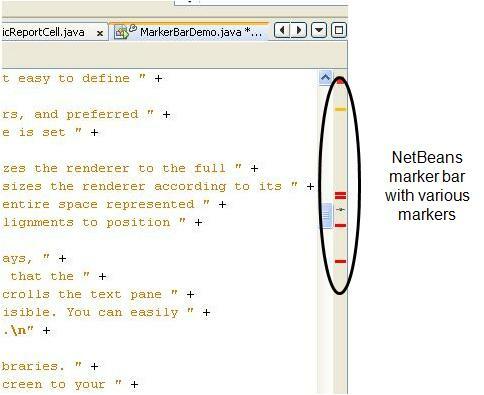 Here is a screen shot of a marker bar within NetBeans. Although the above screen shot shows markers for compiler errors, source code suggestions, and the current cursor position, the possible uses for markers are endless. Markers can also represent search matches, bookmarks, headings, file differences, and anything else conceivably found in a document. The Marker Bar Library contains a Java Swing component, JMarkerBar, that draws a marker bar. JMarkerBar can be laid out vertically or horizontally depending on its orientation property. You can set its orientation to JMarkerBar.Y_AXIS to force the marker bar to be laid out vertically or to JMarkerBar.X_AXIS to get a horizontal bar. Alternatively, the constants JMarkerBar.PAGE_AXIS and JMarkerBar.LINE_AXIS will use the locale to determine the direction. The default orientation is PAGE_AXIS. In the United States locale, the following code snippet creates a vertical JMarkerBar and adds it to the right of a scroll pane. You can think of a marker bar as a range from 0.0 to 1.0, where 0.0 represents the start of the bar and 1.0 represents the end. Then each marker defines a range within the marker bar's range. For example, a marker may define the range [0.32,0.62], as in the following illustrations. The getStart method returns the marker's starting percentage along the marker bar, while getEnd returns the end percentage. The method getShortDescription allows you to give a marker a textual description, which is used as the marker's tooltip by the default renderer. You may define your own implementations of the Marker interface or use the pre-defined DefaultMarker class. A JMarkerBar contains a list of Marker objects. Instead of defining a new type of model for a JMarkerBar, the library uses the well-known javax.swing.ListModel to supply the markers. You can pass the list of markers to JMarkerBar's constructor or set it with a call to setModel. Even though the ListModel interface allows elements of any type, the list model given to the JMarkerBar must return elements that implement the Marker interface. The contents of the list model are allowed to change dynamically, and the marker bar redraws itself accordingly. The markers are drawn in the order returned by the list model. Since markers may be drawn on top of each other, it is your responsibility to return the correct order and to coordinate overlapping markers, if necessary. The following code creates a marker bar with a hard-coded marker. The marker range in the above example is arbitrary and used stricly as an example. Ranges typically correspond to locations within a text component, list, or table. Therefore, the library provides static Utility methods to aid in converting component indices into markers. The following code uses one of these Utility methods to acquire a more meaningful marker range. Listeners can determine the marker that was clicked by calling getClickedIndex on the JMarkerBar. The marker index can then be used to fetch the marker in the list model if needed. Since a common action is to jump to the location marked by the marker, the Utility class provides some helpful methods for scrolling. Just like javax.swing.JTable and javax.swing.JList do, JMarkerBar uses a renderer to draw the individual markers. The default renderer--an instance of DefaultMarkerRenderer--draws a marker as a rectangle using the JMarkerBar's foreground color. You can change the color either by changing the marker bar's foreground or by calling setColor on the DefaultMarkerRenderer, as in the following example. By default, the rectangle will be drawn the full width of the bar and the full height corresponding to the marker's range. You can adjust the dimensions of the rectangle by setting the DefaultMarkerRenderer's preferred and minimum sizes. The above example wishes each marker to occupy the full width of the marker bar and to be exactly 3 pixels high. 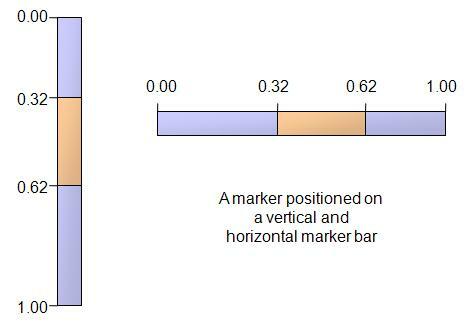 If the region given to a renderer is smaller than the full marker's region, then the marker bar uses the renderer's X and Y alignments to position the marker horizontally and vertically. The above example sets the Y alignment to 0.0, meaning that the rectangle should be positioned at the top of the marker's region. Such a renderer allows you to build sophisticated marker bars with a mix of colors, styles, borders, shapes, and sizes.